A file photo of a Japanese H-2A rocket launching a payload into orbit from Japan's Tanagashima Space Center. Japan launched two spy satellites Sunday to collect sharp imagery for the government's defense and intelligence agencies, continuing a series of clandestine space missions devised to keep track of North Korean military activity. The payloads lifted off on a Japanese H-2A rocket at 0440 GMT (11:40 p.m. EST) from the Tanegashima Space Center, Japan's primary launch site nestled on a picturesque island in the Pacific Ocean. Liftoff occurred at 1:40 p.m. local time in Japan, and the rocket pitched southeast from Tanegashima before turning south for its ascent to orbit over the Pacific Ocean. The launch was streamed live online by amateur observers, but there was no official webcast provided by the Japanese government or Mitsubishi Heavy Industries, the H-2A rocket's commercial operator. The H-2A rocket surpassed the speed of sound in less than a minute, and 1.6 million pounds of thrust pushed the orange and white launcher higher over the Pacific Ocean. The solid-fueled boosters jettisoned about two minutes after liftoff, and the rocket's nose fairing released as the H-2A rocket reached the thin upper atmosphere. The rocket's cryogenic upper stage took over next, igniting to put the mission's two secretive payloads into orbit. The launch marked the 22nd flight of an H-2A rocket and the eighth launch dedicated to Japan's spy satellite program. Japanese officials declared the launch a success about 20 minutes after liftoff. Two payloads were aboard the H-2A rocket, the country's fourth radar reconnaissance satellite and a demonstration craft with an optical camera, according to the Japan Aerospace Exploration Agency, which owns the Tanegashima Space Center. The Japanese government calls the spacecraft Information Gathering Satellites. The radar-equipped satellite can take pictures of the ground day-and-night and in all weather conditions. Japan has not disclosed the exact capabilities of the satellites, including their imaging resolution. The most advanced Japanese reconnaissance satellites likely provide imagery with a resolution less than a meter. The optical demonstration craft launched Sunday may provide imagery with a resolution as high as 40 centimeters, or about 15 inches, better than U.S. commercial imaging satellites, according to the Kyodo news agency. Japan established the space-based reconnaissance program in the wake of a North Korean missile test over Japanese territory in 1998. Although the program was initially aimed at monitoring North Korea, the satellites can take pictures of nearly any place on Earth each day. The first Information Gathering Satellites were launched in 2003. Japanese officials used imagery from the IGS program in the aftermath of the March 2011 earthquake that spawned a devastating tsunami and the following crisis at the Fukushima nuclear power plant. 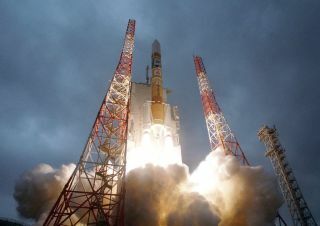 Sunday's mission marked the first space launch of the year for Japan, which plans at least three more launches in 2013. In July, Japan will launch its fourth robotic cargo craft to the International Space Station aboard the heavy-lift H-2B rocket. In the autumn, Japan plans the first flight of its smaller solid-fueled Epsilon satellite launcher from the Uchinoura Space Center on the south shore of Kyushu, the southernmost of Japan's main islands. Before the end of 2013, another H-2A rocket will deploy JAXA's second Advanced Land Observing Satellite, which will collect environmental data for climate science and disaster response applications.